This week's Excel Optical Illusion is called Eye Jitter. 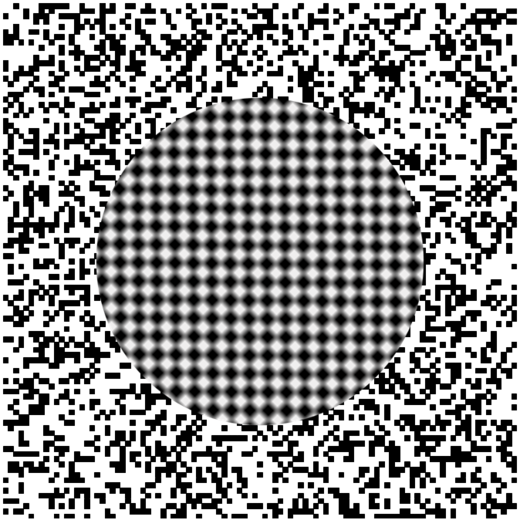 The central disk appears to float and jitter above the random background. You can control the density of the background by entering a value in the density field, which tells the chart how many columns to use for the series source. Trying different values from 0 to 100 changes the intensity of the illusion. I'll have another next week. This page contains a single entry by Daniel Ferry published on April 2, 2010 7:43 PM. Excel Lissajous Curve Explorer was the previous entry in this blog. Excel Streamgraph is the next entry in this blog.